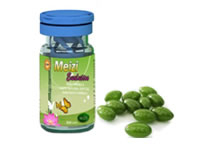 Meizi Evolution Botanical Slimming Soft Gel is a kind of most effective capsules to make you lose weight quickly and safely. If you have ever tried Meizi Evolution, you will probably never let it go. And if you have never known Meizi Evolution, it is believed not to let you down. faster and safer weight loss. -. Extracts from natural botanical extracts without side effects. -. Boosting fat metabolism and blocking the non-fat material converting into fat. -. Smoothing the intestines to relax the bowels and cleaning the intestines system. -. Focus on waist belly and the position where fat easily accumulated characteristic. -. Reduce the risk of high cholesterol, hypertension and diabetes. How Meizi Evolution makes you lose weight? -. Speeding up the fat consumption: The ingredient named leptin quick alkali enhances the ATP circulation to boost the fat breaking up rate. -. Stopping the body absorbing fat: By the intake of 5HT, people will feel full. And 5HT won't affect the normal fat absorption, thereby decreasing the fat accumulation. -. Accelerating the fat breaking up: It contains the active ingredients of lipolysis enzyme, to discompose the fat of belly, stomach and hip, slimming the wait size. Take 1 pill each time and only once each day (the effect will be better when taking the capsule before breakfast). People between 18 and 60. It can not be taken together with other drugs. -. 1 capsule a day before or after breakfast, Do not take more capsules than recommended. -. Drink more water and eat more fruit if thirsty (not enough pure water in your body reduces the body's glucose level in the blood, which causes weakness and dizziness). -. Do not skip meals (especially breakfast or lunch). It is important while taking this product to maintain a healthy and balanced diet, including pure water and natural juices. -. Do not consume alcohol while taking Capsules. It may neutralize the effectiveness of the slimming process. -. Pregnant woman and breastfeeding woman should not take Meizi Evolution. The responsibility of using this product, like any other dietary supplement, is one who takes it, so if you have any questions, consult your trusted doctor before taking. Result will vary for everyone. Side effects may include nausea and dizziness. 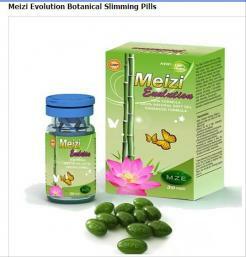 Meizi Evolution Botanical slimming Soft gel Marked MZE, maintains the normal diet status according to different stages of slimming, promoting the principle of "full up and keep a good table, health slimming" and trying to achieve the following: No anorexia, no diarrhea, no necessity to avoid certain food, no necessity to go on a diet, no rebounding, and directional slimming. Weight loss Meizi Evolution Botanical slimming Soft Gel diet pills by natural plant is the most popular slimming method around the globe. Meizi Evolution Botanical slimming Soft Gel selects the natural plants which have beautifying and slimming effects. 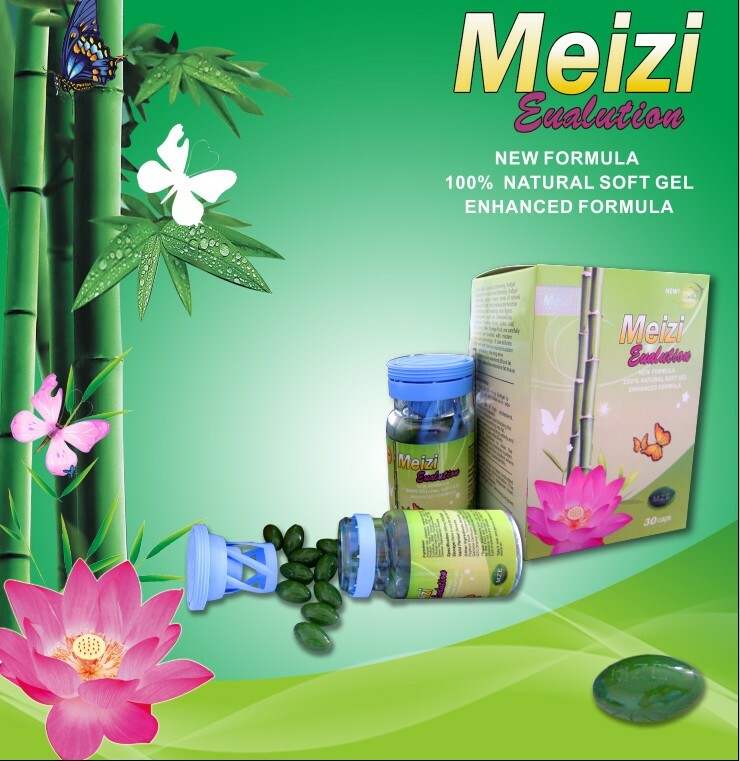 The ingredients of Meizi Evolution Botanical Slimming Soft Gel could adjust body's function comprehensively in full aspects through their functions of invigorating like, lowing-down blood fat, removing dampness by diuresis, invigorating the circulation of blood and absorbing clots. No necessity to go on a diet, and no rebounding when taking Meizi Evolution Botanical Slimming Soft Gel . -. Decrease the formation and absorption of the fattiness dilute and burn fattiness efficiently nutritional, safe, no tummy, no rebounded. -. Suited community: it is more suitable for those with stubborn fattiness or the persons are inefficient in slimming, also suitable for those with simple fatness. Meizi Evolution Botanical Slimming Soft Gel is one magic product that prove itself by enabling thousands of women become slim, focus on waist belly and the position where fat easily accumulated. Meizi Evolution Botanical Slimming Soft Gel has gained many highly appreciates from its users, roughly estimated statistics showed that people can reduce about 15 pounds in a month! combine more natural extracts from Chinese herbals. Meizi Evolution Botanical Slimming Soft Gel is the stronger solution of botanical slimming with its characters of quicker and safer weight loss effect! Xianxian Cao, Jobstears, Artemisia Dracunculua, Psyllium Husk, Bamboo Shoot, Lotus Leaf, Tuchahoe, Bitter Orange, Fruit, Acai Berry, Aloe, Chitosan, Garchinia Cambogia, Dietary Fiber, Green tea, Coenzyme Q10, Oriental Water plantain Rhizonme. Focusing on waist, belly and the position where fat easily accumulated. For general obesity, pubertal fat and postpartum weight gain. Especially effective for people who always fail to reduce weight or those who tend to regain fat. Besides, it is also a good choice for whoever just wants to keep slim. Meizi Evolution Botanical Slimming soft gel is an evolution in slimming. As a most effective capsule Meizi Evolution is a giant stand on the shoulders of former Meizitang series products. Meizi Evolution- the best of all botanical slimming products has character of fasting slimming effect which could help you lose weight quickly and safely. MZE is specially developed for American and European people’s physique that are easy get fats accumulate on the waist, belly and legs.If you have ever tried, you will probably never let it go. And if you have never known Meizi Evolution, it will not let you down. -. Not to take Meizi Evolution Soft gel together with other medication. -. No need to skip meals when taking Meizi Evolution. -. Never consume alcohol when taking Meizi Evolution Botanical Slimming Soft Gel. -. Drink more water in case of thirsty. This product helped me lose 3 inches off my waist in the first 2 weeks. I am 5'4, I started at 158lb. I am now 152lb. I stopped drinking beer, and I continued with my workouts and meal plan. This product works, it has worked for me because it is an addition to my health journey. I have a few extra pounds and is difficult to lose them. I try yoga and pilates and still don't lose nothing. So I start with this pill and yoga and I lost 7 pounds. Very happy, and I will continue with Meizi Evolution for a few more months because we use to eat more during holidays. I was nervous and when I do, I eat a lot. This pill controls my appetite and now I feel excellent. Losing weight and control myself.. I have lost 20kg in about 2 and a half months! I have referred so many people to these tablets because I have finally found something that works! They are the real deal!